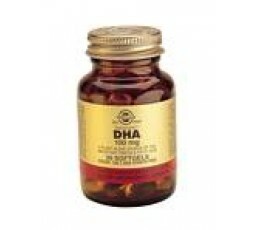 DHA is a long chain polyunsaturated fatty acid normally found in oily fish such as sardines, mackerel and salmon. However, Solgar's DHA is derived from a plant algae source rich in the important Omega 3 fatty acid. 200mg High Oleic Sunflower Oil approx. Take 1 to 2 softgels daily with meals, or as directed by a healthcare practitioner.